Hepatectomies are performed to surgically remove tumors from the liver. Most liver cancers start in liver cells called "hepatocytes." The resulting cancer is called hepatocellular carcinoma or malignant hepatoma. The type of cancer that can be removed by hepatectomy is called a localized resectable (removable) liver cancer. It is diagnosed as such when there is no evidence that it has spread to the nearby lymph nodes or to any other parts of the body. Laboratory tests also show that the liver is working well. As part of a multidisciplinary approach, the procedure can offer a chance of long-term remission to patients otherwise guaranteed of having a poor outcome. According to the National Cancer Institute (NCI), liver cancer is relatively uncommon in the United States, although its incidence is rising, mostly as a result of the spread of hepatitis C. However, it is the most common cancer in Africa and Asia, with more than one million new cases diagnosed each year. In the United States, liver cancer and cancer of the bile ducts only account for about 1.5% of all cancer cases. Liver cancer is also associated with cirrhosis in 50–80% of patients. The extent of the hepatectomy will depend on the size, number, and location of the cancer. It also depends on whether liver function is still adequate. The surgeon may remove a part of the liver that contains the tumor, an entire lobe, or an even larger portion of the liver. In a partial hepatectomy, the surgeon leaves a margin of healthy liver tissue to maintain the functions of the liver. For some patients, liver transplantation may be indicated. In this case, the transplant surgeon performs a total hepatectomy, meaning that the patient's entire liver is removed, and it is replaced with a healthy liver from a donor. A liver transplant is an option only if the cancer has not spread outside the liver and only if a suitable donor liver can be found that matches the patient. While waiting for an adequate donor, the health care team monitors the patient's health while providing other therapy. Freeing the liver. The first task of the surgeon is to free the liver by cutting the long fibers that wrap it. Removal of segments. Once the surgeon has freed the liver, the removal of segments can start. The surgeon must avoid rupturing important blood vessels to avoid a hemorrage. Two different techniques can be used. The first has the surgeon make a superficial burn with an electric lancet on the surface of the liver to mark the junction between the sections marked for removal and the rest of the liver. He/she cuts out the section, and then tears towards the hepatic parenchyma. It is the difference in resistance between the parenchyma and the vessels that allows the surgeon to identify the presence of a vessel. At this point, he/she isolates the vessel by removing the surrounding connective tissue, and then clamps it. The surgeon can then cut the vessel, without any danger to the patient. The second technique involves identifying the large vessels feeding the segments to be removed. The surgeon operates first at the level of the veins to free and then clamp the vessels required. Finally, the surgeon can make incisions without worrying about cutting little vessels. To prepare a patient for a hepactectomy, clean towels are laid across the patient's face, along the sides, and across the knees. The anterior portion of the chest, the abdomen, and the lower extremities down to the knees are scrubbed with betadine for 10 minutes. In the event of a patient being allergic to iodine, hibiscrub may be used as an alternative. On completion of the scrub, two sterile towels are used to pat the area dry. The area is then painted with iodine in alcohol, and draping proceeds with side drapes, arm board drapes, top and bottom drapes, and a large steridrape. Three suction devices, one diathermy pencil, and one forceps are placed conveniently around the field. After an hepatectomy, the healing process takes time; the amount of time required to recover varies from patient to patient. Patients are often uncomfortable for the first few days following surgery and they are usually prescribed pain medication. The treating physician or nurse is available to discuss pain management . Patients usually feel very tired or weak for a while. Also, patients may have diarrhea and a feeling of fullness in the abdomen. The health care team closely monitors the patient for bleeding, infection, liver failure, or other problems requiring immediate medical attention. After a total hepatectomy followed by a liver transplant, the patient usually stays in the hospital for several weeks. During that time, the health care team constantly monitors how well the patient is accepting the donated liver. The patient is prescribed drugs to prevent the body from rejecting the transplant, which may cause puffiness in the face, high blood pressure, or an increase in body hair. There are also risks that are specific only to liver surgery. During the preoperative evaluation, the treatment team tries to evaluate the patient's liver so that they can decide what piece can safely be removed. Removal of a portion of the liver may cause the remaining liver to work poorly for a short period of time. The remaining part of the liver will begin to grow back within a few weeks and will improve. However, a patient may develop liver failure. The results of a hepactetomy are considered normal when liver function resumes following a partial hepatectomy, or when the transplant liver starts functioning in the case of a total hepatectomy. Liver cancer may be cured by hepatectomy, although surgery is the treatment of choice for only a small fraction of patients with localized disease. Prognosis depends on the extent of the cancer and of liver function impairment. According to the NCI, five-year survival rates are very low in the United States, usually less than 10%. Non-Hispanic white men and women have the lowest incidence of and mortality rates for primary liver cancer. Rates in the black and Hispanic populations are roughly twice as high as the rates in whites. The highest incidence rate is in Vietnamese men (41.8 per 100,000), probably reflecting risks associated with the high prevalence of viral hepatitis infections in their homeland. Other Asian-American groups also have liver cancer incidence and mortality rates several times higher than the white population. There are no alternatives because hepatectomies are performed when liver cancer does not respond to other treatments. 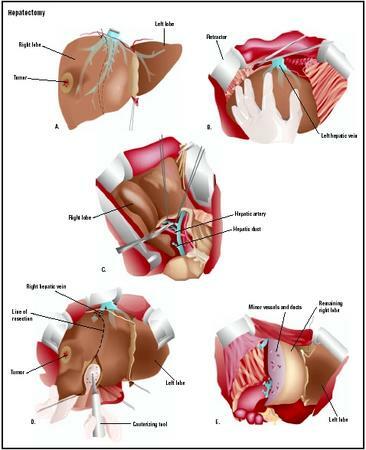 Blumgart, L. H. Surgery of the Liver and Biliary Tract. New York: Churchill Livingstone, 1994. Carr, B. I. Hepatocellular Cancer: Diagnosis and Treatment (Current Clinical Oncology). Totowa, NJ: Humana Press, 2003. Dionigi, R. and J. Madariaga. New Technologies for Liver Resections. Basel: S. Karger Publishing, 1997. Okita, K. Progress in Hepatocellular Carcinoma Treatment. New York: Springer Verlag, 2000. Ganti, A. L., A. Sardi, and J. Gordon. "Laparoscopic Treatment of Large True Cysts of the Liver and Spleen Is Ineffective." American Surgeon, 68 (November 2002): 1012–1017. Hemming, A. W., D. R. Nelson, and A. I. Reed. "Liver Transplantation for Hepatocellular Carcinoma." Minerva Chirurgica, 57 (October 2002): 575–585. Joshi, R. M., P. K. Wagle, A. Darbari, D. G. Chhabra, P. S. Patnaik, and M. P. Katrak. "Hepatic Resection for Benign Liver Pathology—Report of Two Cases." Indian Journal of Gastroenterology, 21 (July–August 2003): 157–159. Kammula, U. S., J. F. Buell, D. M. Labow, S. Rosen, J. M. Millis, and M. C. Posner. "Surgical Management of Benign Tumors of the Liver." International Journal of Gastrointestinal Cancer, 30 (2000): 141–146. Matot, I., O. Scheinin, A. Eid, and O. Jurim. "Epidural Anesthesia and Analgesia in Liver Resection." Anesthesia and Analgesia, 95 (November 2002): 1179–1181. Zhou, G., W. Cai, H. Li, Y, Zhu, and J. J. Fung. "Experiences Relating to Management of Biliary Tract Complications Following Liver Transplantation in 96 Cases." Chinese Medical Journal, 115 (October 2002): 1533–1537. National Cancer Institute. Suite 3036A, 6116 Executive Boulevard, MSC8322, Bethesda, MD 20892-8322. (800) 422-6237. http://www.cancer.gov/ . Cancer Information Service [cited July 6, 2003]. http://cis.nci.nih.gov/ . Liver Cancer Homepage [cited July 6, 2003]. http://www.nci.nih.gov/cancerinfo/types/liver . A hepactectomy is performed in a hospital setting by a surgeon assisted by a full abdominal surgery team, and possibly an oncologist. What tests do I need to determine what type of hepatectomy is required? How many hepatectomies do you perform in a year? How long do I need to remain in the hospital? How will the hepatectomy affect my normal activities? I wanna ask about total hepatectomy in case of hepatic cancer or chronic hepatic cirrihosis with portal vien thrombosis .. isn't mean that liver didn't work ?? why can't we remove the liver permanently ????? and give the enzyms IV & bile salts orally ?? isn't better from leaving a tumor to spread ?????? this is n response to the questions asked by " lookin for answer" total hepatectomy can be performed only when we can transplant a new liver either from a brean dead donor or part of a healthy liver from a related living donor. part of a liver can be removed in selected cases of liver cancer. liver transplantation is an option in some cases of liver tumour and in some cases of cirrhosis. only providing "enzymes and bile salts" is not feasible bcoz liver performs numerous complex functions inside the body which is not possible to be supplemented externally. I'am a chronic hep b patient and have been diagnose with a liver cancer at section 6 of my liver. I was scheduled for surgery in last Feb but i had to postponed it to Apr due to certain personal problems. At that time my tumor sized was 5 x 3 cm. My question is how fast usually the tumor grows and do i need to do a new ct scan before the surgery. Thank you. I was diagnosed with cirrhosis(stage 6) and I am in the early stages of liver failure...having all symptoms except for coma. My daughter is a match as donar. I am not getting many answers from my family physician or any of my specialists. Am I eligable for a transplant.I have been misdiagnosed three times and I did not know my daughter was a match she took it upon herself to get checked nad I was informed when the same testing was asked of me. My dad had Liver Cancer, he had this done a U of M. He never bounced back from sugery, He died 14 months later. I know with liver cancer you don't live more then 5 yrs. but to see him go from 205 down to 95 lbs in 14 months was horrific. I miss him so much. You can do chemo for Liver cancer now. Look at other ways of getting rid of the cancer. I had a tumor in the duct of the liver and was operated on for 11 hours.The sur)geon cut away 65% of my liver and all went well.Recovering now and putting the weight back on.Huge scar left on my tummy and a lot of pain to go through but it was worth every bit.The whole tumor was removed I and did not need chemo or radio therapy afterwards thank god. Where are the answers to all these questions? ?